BIDELL EQUIPMENT LP. Is a Leading Supplier of Reciprocating and Rotary Screw Natural Gas Compression. Our Mission is to exceed customer expectations through Superior Sales and Service. We are looking for a Part Time Office Administration Assistant. This will begin as a 3 day a week position, Monday, Wednesday and Friday with the role increasing to Full time as warranted. Duties -include Receptionist Duties, Data Entry in our ERP System, Assisting with paperwork where required. Diligence and Attention to Detail is critical for this role. Salary will be commensurate with experience. Knowledge of Outlook, Excel, and Word is an asset. Prior Data Entry experience would be an asset. 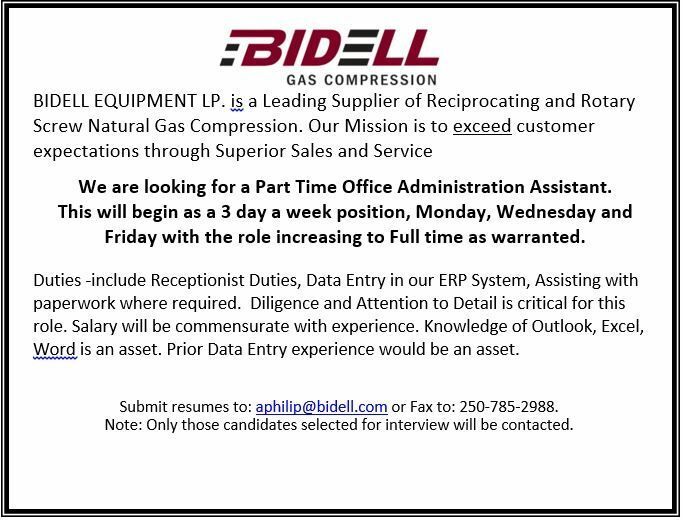 Submit resumes to: aphilip@bidell.com or Fax to: 250-785-2988.